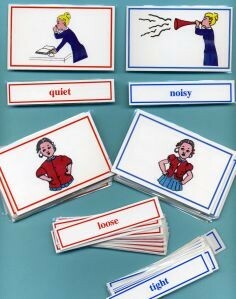 The antonym exercise consists of 40 picture cards (3.5”x2.”) and labels to match. The exercise is coded and coordinated with the Albanesi Curriculum Program (ACP). The printed notes of this Montessori presentation from our CME Teacher Preparation Course are available for purchase from this webpage. Please search for: Antonyms Exercises.